Thirty-six million years ago, great forests began to grow and flourish, thriving in rich soil and a gentle climate to become forest giants of their time. Some of these trees towered a hundred feet into the sky, measuring twelve, fifteen feet across, a rare size today. Many had lived more than a thousand years and still they thrived. It seemed they were destined to live out their role in nature as ageing giants in a vast forest. The unpredictable and mysterious forces of nature joined to change this. 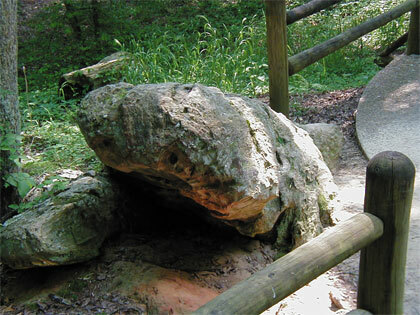 The Caveman's Bench (left) offers visitors an interesting spot for taking photographs. A natural catastrophe occurred in the region of that great forest thirty-six million years ago. The time of change for the mighty trees had come. A torrential flood carried then hundreds of miles southward, eventually emptying into an ancient sea, forming new land near the center of what was to become Mississippi. 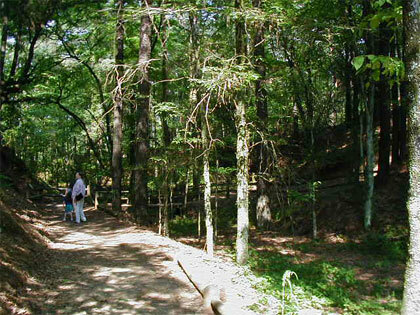 When the Petrified Forest of Mississippi was being formed, the southern third of Mississippi was not yet created. Changes would come about over time — millions of years. The nameless prehistoric river and later rivers followed the same path. Each brought more sand, silt and soil, gradually depositing their burden over the land that became Mississippi. The Frog (right) weighs in at 14,940 lbs. Shirl Schabilion told me that my brothers and I named this lage piece of petrified wood "The Frog" when we were tiny children. I guess the name stuck. The battered ancient logs — Sequoia, Maple, Fir, Spurge, and some other varieties now extinct — were at the end of the long, stormy river journey. Now the tree trunks were thrust into massive sandbars. Snagged with debris the raging river carried, they were blocked by barriers the river itself had formed and began to pile up in a tremendous log-jam. Under the mantle of murky waters, covered by tons of silt and sand, the gentle transformation began. Above the deeply buried logs, layers of fine sands continued to build. The minerals that were to transform the logs began to perform a miracle in the entombed logs. There were several minerals — silica added colors of white and tan; iron, rust and brown; manganese added black. Other minerals present joined the process that was slowly taking place — turning once living trees into great logs of stone. During ages of time and in the deep silence of their entombment, the logs changed. Slowly, with great detail and beauty, the minerals began infiltration, filling solidly, cell by cell. 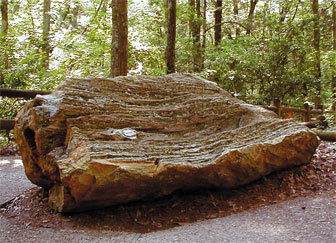 Once living tree trunks began the change to solid, hard stone logs. As eons of time passed, the covering soils became ever deeper. The giant stone logs would tell their own story in their own time. They would remain deeply buried for more millions of years, locked in a dark silence where nothing would disturb them. After the silt and soil left behind by floods and rivers eventually dried, the forces of wind came into play. From the west across this dried and dusty soil, some of the most ferocious dust storms in the history of this continent rolled east and south. Eventually the winds diminished and the land settled. Much of this dust would fall over the region where the stone logs had long lain buried, covering them deeper with this wind-blown, tan soil. For thousands of years this pattern of blowing and subsiding continued and the dust (called Loess and pronounced lers) became hard and compact as it grew deeper and turned almost rock-like in appearance. It remained thus for more thousands of years during the Pleistocene Age. 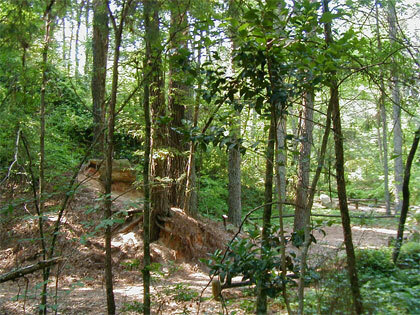 For nearly ten thousand years, Indians made this place not only home, but hunting grounds, and at times battlefields: the mound builders of the Tunica and the Marksville tribes, followed by the Choctaw. Gradually the white man began to follow unknowingly the ancient path of the great logs that were eventually exposed through the forces of erosion. The land had become impossible to farm and was abandoned, left to the natural forces of erosion. About 1854 the earliest recorded information about the Petrified Forest appeared. The first Assistant State Geologist, B.L.C. Wailes received word about a “standing petrified tree in Madison County.” A thorough researcher, he checked the report but did not find a standing petrified tree. What he did see, though, was important enough to record in his papers and letters. Wailes had seen the very beginning of the petrified logs being uncovered by nature. Erosion has kept working over the years, revealing the red sand layers in which the stone logs had been buried for over thirty-six million years. Within not more than a hundred or so years, many of the stately stone logs have become visible to the sight of man. Nature continues in her own way to uncover more logs as time goes by. The river with no name left a secret treasure here, one studied by many scientists. A large number of the huge stone logs have been identified and named. Now, everyone can enjoy walking among the logs, touching their rocky hardness, marveling at their size. It is a pleasant journey through the ages of time, to ponder and enjoy in its ever changing beauty. The pines and cedars of today’s living forest are sentinels above the petrified logs giving us a glimpse into an age millions of years ago in a most remarkable way—in the wonderful old trees turned to stone. The Petrified Forest is open daily (closed only on Christmas Day) and is located 20 miles north of Jackson, Mississippi in Flora off Highway 49. 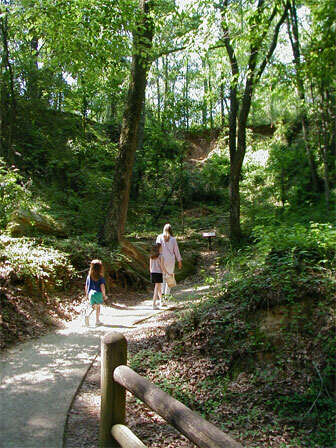 From I-220 in Jackson, take Highway 49 north to Flora, and follow the signs you’ll see just before reaching Flora. Additional attractions: Museum, Gemstone Fluming, Picnic Area, Camp Ground, Native Wildlife Display, Rock Shop, and Nature Trail through the Petrified Forest. Current admission information can be found on their Web site. In the museum, one can enjoy such vivid wonders as fluorescent rocks (below). Call 601/879-8189 for information and/or group rates, or visit their Web site. April 1 to Labor Day — 9 a.m. to 6 p.m.
Labor Day to April 1 — 9 a.m. to 5 p.m.
Shirl Schabilion is one of the founders of the Petrified Forest.